A special adaptation of the big-screen retelling of the epic poem from filmmakers Neil Gaiman, Roger Avary, and Robert Zemeckis! 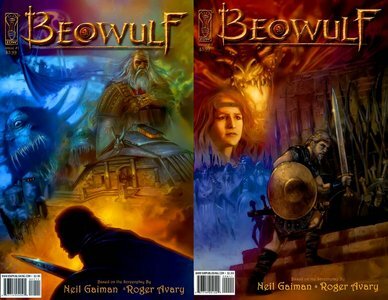 In the sixth century, the warrior Beowulf must do battle with the monster Grendel as well as Grendel's mother and a dragon who has a personal connection to the Scandanavian warrior. Adapted by Chris Ryall and Gabriel Rodriguez (Clive Barker's The Great and Secret Show)." All High Quality Minutemen Scans. The Rawhide Kid’s adventures were previously chronicled by Atlas Comics from 1955-1957, in Rawhide Kid issues 1-16. While under Atlas, the kid was a tall, confident do-gooder who believed in following and upholding the law, no matter what. In a Batman-like moment, he adopts a young boy named Randy whose father was murdered by an outlaw. When Marvel took over in 1960, they picked up the numbering from the previous series, but virtually nothing else. The Rawhide Kid was revamped to be a diminutive red-head who found himself an outlaw after a misunderstanding following a gun fight. The series ran from 1960 to 1979 for a total of 151 issues. Picture Stories from the Bible (Old Testament) was a Golden Age anthology comic released by DC Comics in the early 40's that ran for four issues featuring such Biblical characters as Moses, Joseph and Saul but due to it being copyrighted and published by M.C. Gaines it would later be reprinted under his publisher EC Comics. It also had a counterpart featuring comic retellings of stories from the New Testament. The book you were waiting for! Is! Finally! Here! Caesar is just a busboy at the an Asian seafood restaurant, until that is, he eats one of the Guandong Factory's famous magic fortune cookies-- then he's transformed into the astounding warrior, Sharknife, defender of delicacies and destroyer of dessert-interrupting monsters! It's big action, big monsters, and big attitude in this big sequel from the Rey! BRIAN AZZARELLO and EDUARDO RISSO - the Eisner Award-winning creators of 100 BULLETS - return to Vertigo with their new interstellar mystery SPACEMAN. SPACEMAN tells the story of Orson - a hulking, lonely loser who spends his days collecting scrap metal and dreaming of the startrekking life he was genetically engineered for. When Orson finds himself at the center of a celebrity child kidnapping case, he sees a chance to raise himself out of his sad life and become a hero, but a hero's life may not be the life he thought it would be. Orson's adventures throw him into harsher realities than those he was designed for, where bloodthirsty pirates are hunting the same "treasure," though only Orson wants to find the "treasure" alive. Can Orson overcome his crippling personal failures, drugs and pirates to do the right thing and find meaning in his life? Warren Ellis is unleashed on this all-new, on-going, monthly sci-fi series! It’s the near future. No-one has their flying car. Everyone feels cheated. What America needs now is a Mad Scientist. A city with a secret is shocked out of its apathy by the return of a young technological genius who has reinvented himself as Doktor Sleepless. But perhaps he never left and perhaps his planned new future doesn’t include the city. For fans of Ellis’ fantastic sci-fi tales and have missed the absence of Transmetropolitan, this series is what the Doktor ordered! Tia Stanton is not an ordinary woman. Created from a mystical rite, she is birthed into a world where chaos and organization run side by side; where monster and man live in unison but rarely with recognition of each other. Until, the race begins - a fight to gain access to the pool of power lying beneath her hometown of Greenwich, Connecticut. It coincides with her twenty-fifth birthday and her last chance to accept the full mantel of this supernatural power. Tia is forced to deal with the fact she's different. That she can recycle sin energy and make something good out of it. The world is literally at stake, as is a multitude of other planets which are tied to her own. Anne Elizabeth's PULSE OF POWER - feel the pulse and prepare to power up! Destiny is always a choice. Garth Ennis re-defines the Western with this sweeping six issue epic. Joe Dunn is one of the last bastions of the old guard drifters, those men that could be trusted to defend the common man with integrity, honor, and if need be, hot steel of death. Dunn has been away from Montana for more than 15 years, lost to all who knew him. Now he comes riding into a small town, Dunn still representing the best of the past, an era quickly fading. But it is 1899, the way things are done is changing, the future is coming. But before he is done making things right, the bodies will pile up while the streets run red with glorious blood. Ennis teams with Mike Wolfer for this epic full color series that promises to thrill every fan of Garth's powerful story-telling and brutal violence. In the 22nd century, crime runs rampant in Mega-City One, home to over 400 million citizens, robots, criminals, and lunatics. The only line of defense between anarchy and chaos are... the Judges. And Judge Dredd is the toughest of them all. IDW is proud to re-introduce Judge Dredd to America in this new series. In "The Long Fail" technology is failing all over Mega-City One, causing blackouts, explosions, radiation leaks, and other nasty surprises. As the city spirals into chaos Judge Dredd must fight back with no weapon, no ride, and no backup. Also includes four new back-up stories. Newcomer Gustavo Duarte spins wordless tales brimming with humor, charm, and delightfully twisted horror! In Monsters!, oversized beasts wreak havoc on cities in the tradition of Godzilla and King Kong. In Có!, an alien abduction disarms a gentle farmer, and in Birds, two business partners run from fate only to find themselves hopelessly unable to change the future. The City is an Engine. Heller Wilson has found the key. From acclaimed writer Charles Soule (27, Strongman, Swamp Thing) comes a mathematical thriller about Chaos, Probability, and the race to stop a citywide disaster. In 1978, Dr. Spencer Brownfield saved New York City from itself, bringing the city back from the verge of collapse and ruin. And for thirty years, his small, unnoticed adjustments to the city's systems have kept the city afloat. Or so he claims to Heller Wilson, a young graduate student that Dr. Brownfield has chosen as his successor. But are Dr. Brownfield's claims about The Butterfly Effect and how his "complexity math" apply to the city's patterns of life real, or are they the ravings of a man broken by the death of his wife and daughter, desperate to find some kind of control over the world around him? Part sci-fi, part philosophical exploration, part thriller, STRANGE ATTRACTORS examines what you can control in your life and what you can't, and how important it is to recognize the difference.